At Everyone’s ENT & Sinus Center, they are focused on giving quality and positive care to children and adults of the Stone Oak area in San Antonio, TX office. Dr. Gilliam and her experienced team of professionals provide a comfortable experience to help with ENT problems, allergies, asthma, sleep apnea and more. Our hearing center practice strives to provide the best treatment in hearing healthcare service. Continue reading to learn more about the audiology and hearing department, basic information and services offered. Hearing loss and ringing in the ears can often be a part of the aging process. However, there are some medical conditions where hearing loss, ringing in the ears (tinnitus), balance problems and dizziness are primary symptoms. Should you have any of these symptoms, it is important that you be seen an otolaryngologist, a physician who specializes in ears, noses, and throats. Diagnostic Hearing Evaluations For All Ages. Assistive Listening Devices And More. 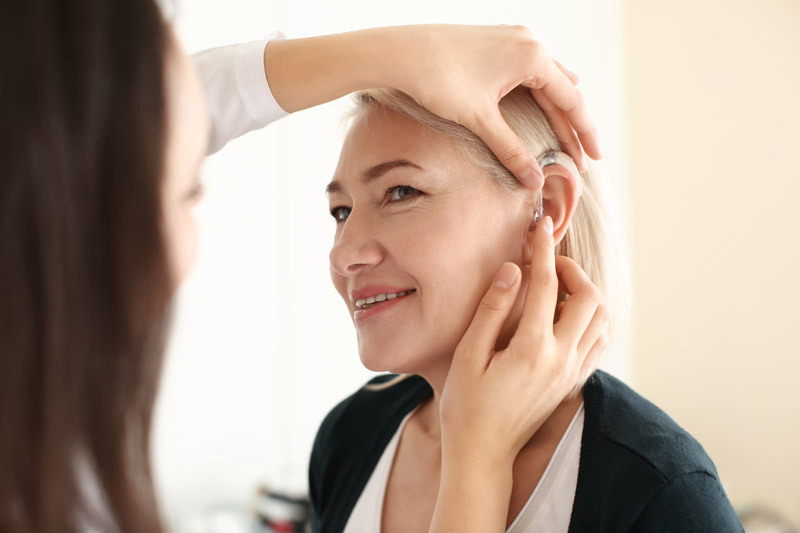 Typically, hearing loss occurs due to a condition affecting one or more of the three main areas of the ear: the outer ear, the middle ear, and the inner ear. More rarely, hearing loss can occur due to conditions affecting the auditory nerve. Some types of hearing loss can be easily reversed, while others may be permanent. Debris can plug the ear canal and prevent the sound waves ability to enter the ear at full potential. This is called Conductive Hearing Loss, which usually results in a mild hearing loss and can be reversed. Medical treatment to remove debris may be necessary. Occasionally, people are born with very small ear canals (stenotic) or no ear canal at all. These people could benefit from surgery or a hearing aid. Middle ear problems also cause Conductive Hearing Loss since the sound cannot be conducted via the vibration of the eardrum or the bones of the middle ear. This can cause a mild to moderate hearing loss. Many middle ear problems can be treated with medication or service. However, if treatment is not sufficient enough to reverse the hearing loss and you do not want to have surgery, hearing aids can be a solution because they will provide the added volume needed to send the sound to the inner ear. Medical clearance for hearing aid use is necessary. A Disarticulation In The Middle Ear. Cholesteotoma (A Benign Mass Of Tissue Growth In The Middle Ear). The natural aging process can cause hearing loss because the tiny hair cells that sense sound wear out from use or the auditory nerve degenerates. Excessive exposure to very loud sudden noises and sounds like artillery, firecrackers, lawn mowers, chain saws, etc. can cause damage to the inner ear structures. Certain medications can be toxic to the hair cells as well. Unfortunately, sensorineural hearing loss cannot be medically reversed. This degree of hearing loss can be mild to profound. Hearing aids are the best choice to improve hearing. Hearing loss can be caused by damage to the auditory nerve that sends the auditory information to the brain. Damage can occur from slow growing tumors that grow on the auditory nerve. These tumors are called acoustic neuromas and must be removed surgically. Hearing may not be spared. Trauma to the skull can cause the auditory nerve to be severed. Hearing is completely lost on the severed side and cannot be reversed. There are implantable devices that may be a viable way of treating this type of hearing loss, but this technology is new. A consultation with an Otologist (ear doctor) is recommended for more information on these procedures. There are over 30 manufacturers of hearing aids in the world today. We work primarily with GN Resound and Phonak, but we are also very familiar with Sonic Innovations, Oticon, Widex, Siemens, Rexton and Unitron. No matter what hearing aid you use, we can service most aids regardless of who the manufacturer is. Digital hearing aids, which are programmed by computers, use digital processing rather than analog to transmit sound waves. This means that they receive the sounds coming in form the microphone, digitize these sounds, send the sound information through a computer processor within the hearing aid, enhance them according to your prescription and deliver the amplified sound to your ear. With digital processing there is no distortion in the signal. Additionally, the programming can be very tone-specific, allowing a precise for the prescription. Instead of just being able to adjust the “low tones” and the “high tones” (2 bands), they can be programmed for specific tones (5 to 20 bands) depending on the hearing aid. The hearing aids are programmed in the office for their basic settings. They then are capable of making decisions on how to amplify the sounds of the environment on their own. They sample the sounds coming at them at thousands of times per second then adjust their response based on these samplings. If the aid detects noise, it can lower the volume for the tone that is similar to the noise, without altering the volume for the speech tones. They can detect feedback (whistling or squealing noise coming from the hearing aid) and eliminate it. Premium digital hearing aids now have different programs that automatically selects from it “hears” in the environment. They provide the cleanest signal with the most specific programming for the hearing needs of each ear. Digital hearing aids are the most technically advanced hearing aids available. The price range varies. Programmable hearing aids have microchips within them, allowing them to be adjusted and programmed using a computer, rather than manually like conventional aids. Although they have analog sound processors, the circuit can be adjusted via a microchip, allowing the ability for some tone and volume adjustments to be made. They typically provide some comfort in noisy and loud environments, by softening loud sounds. Some are capable of holding multiple programs. These additional programs can be accessed by a push button or switch on the hearing aid or by a remote control. These hearing aids may have more than one microphone to enhance speech in noisy situation. They are priced at the same level as the basic entry-level digitals. Because they have fewer features, they are not used much anymore. The circuitry used in conventional hearing aids is basic: a microphone, amplifier and receiver. They use analog technology. They may not be able to soften loud sounds. This can create some discomfort in noisier environments or in the event of a sudden loud sound (e.g. door slam, dog bark). They can be manually adjusted at the time of the fitting to somewhat match your hearing loss prescription target. A patient controlled, manual volume hearing aid has no feedback suppression and is typically worn by patients who have worn conventional aid for many years that like the way they sound. With conventional analog aids, the circuits were not able to tell the difference between a noise and speech. However, now with digital aids, a digital speech processor analyzes sounds coming in continuously. Noise looks a certain way – typically staying the same (think if a fan noise or road noise). Speech looks very different from noise. It starts and stops, has sharp sound and blurred sounds. The digital processor can distinguish between the two pretty well and can reduce the volume of the noise without turning down the volume on the speech. This gives the speech signal the advantage over the noise. The best way to significantly improve hearing in noisy environments is by utilizing more than one microphone. Traditionally, hearing aids only had one microphone and it had to amplify sounds all around you (omni-directional). With addition of a second microphone on the hearing instrument, the first microphone could narrow its scope and become directional – picking up sounds directly in front of it - while the second microphone can pick up sounds coming from the sides and the back, reducing their loudness. Many digital hearing aids now have microphones that are adaptive, changing how they amplify based on the environment they “hear” around them. Thank you for visiting Everyone’s ENT & Sinus Center to learn more about our audiology and hearing services. If you are experiencing any loss of hearing, we would like to meet with you for an examination. Contact us to schedule your first appointment today, or complete an Appointment Request, and one of dedicated staff members will contact you to schedule an appointment time! We look forward to meeting with you at our office in San Antonio, TX.